Stress is a physical or psychological factor that causes tension in the body. Anxiety is emotions or behaviors produced by perceived threat. Both are all too common symptoms of this fast paced, high expectation society in which we live. Common universal stressors in the United States today include money, family, work, health, traffic . . . the list goes on. Anxiety can be an intermittent feeling of nervousness or worry, or it can be a diagnosable disorder defined by a state of excessive uneasiness and/or apprehension. Historically, stress and anxiety were protective responses to promote survival. Too much stress and anxiety can actually have a negative impact on our health and bodies. Chronic stress and anxiety are associated with a list of detrimental problems: immunosuppression and heightened inflammation, metabolic and cardiovascular issues, digestion problems including malnutrition, stunted growth and repair of cells, affective impacts, cognitive impairment, accelerated aging, sleep loss, and even pain sensitization (Dumas, 2018). Stress and anxiety can also develop into diagnosable psychological conditions. In any given year, 1 in 5 Americans will suffer from some type of psychiatric disorder. Approximately 18% of Americans have an anxiety disorder. Stress and anxiety are often comorbid with depression, and approximately 7% of the United States population has a current diagnosis of major depression (NIMH » Mental Illness, 2017). Our patient population experiencing injury and illness is especially vulnerable to stress and anxiety. Furthermore, the aforementioned list of detrimental issues associated with long-term stress and anxiety can negatively impact our patients’ rate of recovery and overall health, subsequently negatively impacting our health profession’s outcomes. For this reason, it is imperative health practitioners begin addressing symptoms of stress and anxiety in out patient populations. As the profession of occupational therapy values a holistic, client-centered approach to medicine and as mental health falls within our scope of practice, I feel occupational therapists have great potential to address stress and anxiety in our skilled treatments — even in the physical disability or pediatric based settings. Keep reading for a list of ways to help manage stress and anxiety for patients, caregivers, and even for yourself as a busy practitioner. 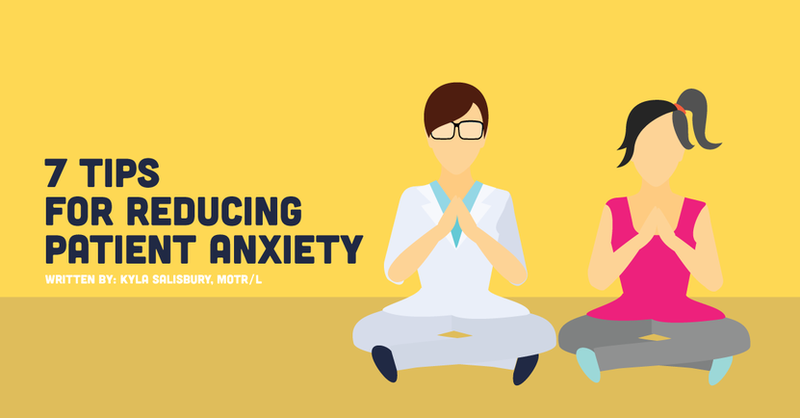 There are several ways occupational therapists can improve predictability and promote behavior adaptation for anxiety management. Many patients experiencing stress from illness or injury have experienced a loss of sense of control and/or the inability to predict future events. Occupational therapists can work to promote an internal sense of control and improve predictability of events. For example, at the start of a session, I often check in with the patient to see how they are doing, discuss goals for the treatment session that date, and work together to make a plan and expectations for the session. Before engaging in treatment such as manual therapy or exercises, I explain the procedure and the reasoning behind why we are working on this area. Addressing treatments sessions in this manner improves predictability and reduces patient apprehension and worry. By allowing the patient to be an active participant in planning therapy sessions, it promotes an internal sense of control, reduces stress, and increases self efficacy. To facilitate generalization of anxiety management outside of therapy, teach your patient to plan ahead and anticipate life events. Instruct on energy conservation for patients experiencing fatigue and help them balance activity with rest for optimal recovery. Recommend patients use heat and ice modalities on a scheduled basis — that means preemptively, prior to experiencing pain! In the event that -inevitably - life does not go as planned, teach adaptability and promote flexibility. I am constantly reminding my patients: Recovery is not a straight line. Many patients who have experienced stress and anxiety for long periods of time may be experiencing cognitive distortions such as learned helplessness or fear avoidance for certain movements or occupations/activities. In these cases, additional time and treatment may be required to focus on identifying thought distortions and reframing cognitive thought processes. To help a patient with this, promote thinking in shades of gray, rather than all or nothing, black or white thinking. Teach your patients the “double standard method”: treat yourself as you would someone who you really care about (Dumas, 2018). Start small and increase activity over time. When a patient feels success, they will be ready and motivated to achieve the next level. In your clinic and treatment sessions, reduce discussions of pain. Teach patients to use less threatening pain descriptors through word shifting. For example, word shifting might comprise of changing the words from “stabbing, burning pain” to “my arm feels not as comfortable and cool than it should.” Negative pain descriptors are threatening to the brain and can increase pain sensitivity. Using more positive words as descriptors (ie: not as cool, comfortable, loose, strong, etc) is less threatening to the brain and actually promotes a direct goal. The brain realizes, instead of being afraid, it needs to work harder to promote comfort, range of motion, and strength. Support optimism. Use positive vocabulary with the patients. Similarly to reducing discussion of pain, decrease discussion of illness and disability. Then, increase use of positive words and emphasis on wellness, health, ability, and prevention. Your patients may benefit from using a gratitude journal, where they create daily records of things/people/events/accomplishments that they are thankful for. Remember to be enthusiastic and cheerful in your work. It is contagious. There are many coping strategies for stress and anxiety management. To identify the ones that may work for you patient, consider their hobbies and interests. Help patients identify strategies that distract or self soothe a patient when they are feeling stress and anxiety symptoms. Distractions can be watching funny videos or reading a book. Self soothing can include listening to their favorite music, drinking a cup of tea, taking a bath or sitting by a comforting, warm fireplace. Promote social support and opportunities to engage in social events within the patient’s abilities. For patients who are struggling, ensure a crisis plan is in place and that they have resources and numbers to call when needed. The National Suicide Prevention Lifeline number is: 1-800-273-8255. Exercise is a great way to expend nervous energy and reduce rumination on negative thoughts. Additionally, exercise combats obesity and increases the body’s ability to achieve homeostasis during anxiety (Dumas, 2018). Develop an exercise plan for your patients. This may be a sensory diet for a pediatric patient or a upper extremity work out plan related to a specific hobby for an adult patient. Make it fun! Long term stress and anxiety can negatively impact metabolic efficiency. The body remains in a state of “fight or flight.” When the body is in “fight or flight” mode, the sympathetic nervous system is working: the heart rate increases, blood vessel constrict, and digestion is reduced. Sympathetic overdrive can lead to decreased digestive enzyme release, reduce smooth muscle contraction in the gut, impaired nutrient absorption, and disrupted protein synthesis from chronic elevated cortisol (Dumas, 2018). To counteract these negative problems, promote healthy eating. Support a diet high in antioxidants, natural food, and avoidance of highly processed foods. Interventions can incorporate meal planning and creating grocery lists that support a healthy diet. Consider a referral to a nutritionist if appropriate. Mindfulness is a mental state achieved by focusing a nonjudgmental awareness on the present moment. Outcomes of mindfulness include a reduced focus on past and future, reduced pain and anxiety, and reduced tendency for mind to wander. There are several ways to promote mindfulness both within treatment sessions and outside of skilled therapy. Today, over 75% of health professionals are recommending complementary medicines (Dumas, 2018). Complementary medicines include: Massage Therapy, Yoga and Meditation, Acupuncture, Herbal Remedies and Aroma and Light Therapies. Survey your patient’s interests and consider if complementary medicine may be a great adjunct to your patient’s recovery process. Use the aforementioned ideas to help combat symptoms of stress and anxiety in your patient caseload. The next time you have a busy week and feel symptoms of stress and anxiety, select one to trial on yourself! Let us know here at NGOT which ones are working for you and your patients. We look forward to hearing your feedback. Dumas, T. C. (2018, May). Calming an overactive brain. Paper presented at Institute for brain potential continuing education course, Bozeman, MT. NIMH » Mental Illness. (2017, November).